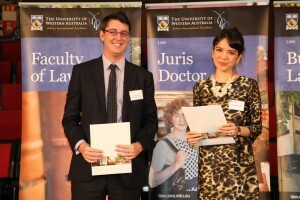 Dell Marie Butler and Brittany Lawtie are the joint recipients of the second annual Kott Gunning prize in the Juris Doctor at The University of Western Australia’s Faculty of Law. Dell Marie Butler was the Faculty of Law’s most awarded student in 2014, taking home a total of six awards. She is an international student from Singapore, and her law studies follow a Bachelor in Social Science (Honours) in Politics and International Relations at The University of Manchester. 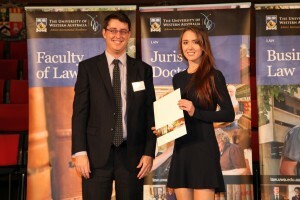 The Kott Gunning award is Brittany Lawtie’s first award for her Juris Doctor, which follows a Bachelor of Education from Edith Cowan University. The prize commenced in 2014 and is awarded to the student with the highest mark in Land Law, a core Juris Doctor unit in the first year. Dean of Law, Professor Erika Techera, said the partnership with Kott Gunning is indicative of its support of young achievers pursuing the impossible through their law studies. “Kott Gunning’s prize demonstrates the firm’s progressive outlook and the importance of celebrating success,” she said.